It was goals galore in the Peterborough League Premier Division last night (August 22) with the four games played producing 29 of them. 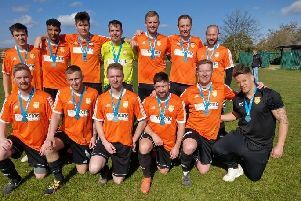 Leading the way were reigning champions Netherton United, who walloped winless Warboys Town 10-0 to move into second place, three points behind Moulton Harrox. Joshua Smith led the way on the scoresheet with a hat-trick, Richard Baines bagged a brace and there were single strikes for Zack Fisher, Fraser Sturgess, Robbie Ellis, Michael Fox and Mark Baines. Leverington Sports also went goal-crazy at home to bottom club Long Sutton Athletic. They won 8-3 with goals from Matthew Cawthorn (3), Lewis Clayton (2), Dan Hempson (2) and Oliver Williams. Langtoft United picked up their first win in 38 Premier Division games on Saturday when defeating Long Sutton 4-0. Last night another came along as they won 3-2 at Ketton through goals by James Goode (2) and Hamza Akram. In the other game last night Peterborough Sports Development beat Peterborough Polonia 3-0. There were three Division One games played last night. The results were: Crowland Town 3, Spalding Town 7; Moulton Harrox Reserves 2, FC Parson Drove 3; Oundle Town 3, Wittering Harriers 3.